Elected Pattaya officials who repeatedly promised to open a new Sukhumvit Road U-turn left office last month without keeping their pledge. 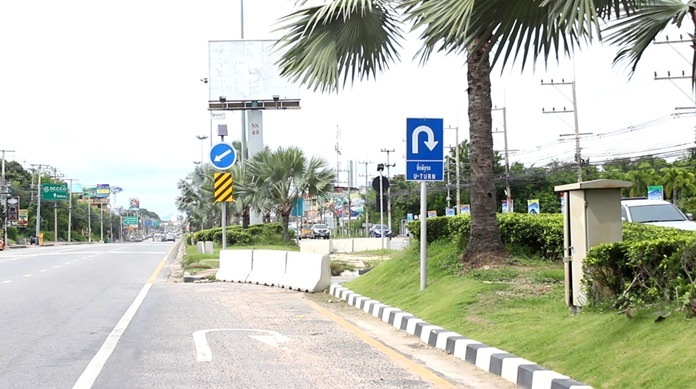 Former Mayor Itthiphol Kunplome said several times over the past year, most recently in February, that the U-turn, near the Makro warehouse store in South Pattaya, would open “soon”. All it needed was some landscaping, new signage and signals. Area residents are still waiting for this U-turn to open. None of them were funded or contracted before Itthiphol and the city council’s term expired June 16. They were replaced by Interior Ministry officials appointed by the junta. Acting Mayor Chanatpong Sriviset acknowledged the elected officials did not move on their promises and said there was nothing that could be done on the issue for the time being. The turn was constructed with a million-baht budget after another turnabout 300 meters away was closed due to numerous accidents there. Area residents complained that the replacement should have opened when the other closed. Instead, safety had been made worse, with drivers turning into Makro’s parking lot in order to turn around. City officials repeatedly apologized for the delay, but said they could not open the new U-turn until a large tree on the center island is removed and signaling equipment put in to warn drivers the U-turn is ahead.